There are very few designers in the world who can make you forget the fact you haven’t had a proper night’s sleep in several weeks (and that it shows), or that you’ve suddenly come down with the flu (hi everyone). Even if you’re feeling your best, it’s rare to have your attention captivated so fully for 20 minutes that your mouth is hanging open. Rei Kawakubo is one of those designers, and yesterday in Paris her Comme des Garçons show was even more proof of that fact. As if you needed it. Here’s what went down. …in a long hall with polished wooden floors and ornamental glass panels hanging from the ceiling. (Also, appropriately I think I spotted Gosha Rubchinskiy pre-show, not far from a giant unfurled Russian flag). The white runway was raised in a zig-zag across the room, and models stepped out and walked its length one at a time. Which might help to explain why the collection mashed up colourful art/illustrations with the sculptural looks that are tradition at Comme des Garçons. This wasn’t as basic as a tag you might find on the side of a bus shelter though, Kawakubo’s graffiti was of course much more conceptual – her silhouettes exploded outwards and had holes which revealed many layers of different fabrics. It was like the material version of when a wall is coated with different artists’ work – a mosaic of colours and styles. From 16th century Italian Giuseppe Arcimboldo, whose fruit face portraits appeared on the first and fifth looks, to E-Boy whose pixel landscapes cropped up on look twelve. The florals were courtesy of Dutch artist Abraham Mignon and as for the giant anime-looking girl with glinting eyes? The work of Japanese-born Macoto Takahashi. The headpieces by Julien d’Ys, works of art in themselves, were made up of items that looked like the kitschy trappings of girlhood like toys, cupcake iPhone cases, kawaii Hello Kitty dolls and plastic rings. Continuing Nike’s fruitful partnership with CdG, this season saw models wear Nike shoes – or rather, the hollow shell of Nike boxing shoes, which were placed over the top of pair of clog-like heels. They came in colour combinations of blue and white, green and white, and, naturally, black. FKA twigs blended into this year’s smash dance hit “Falling” by Alesso, and then, even more unexpectedly, “Closer” by 80s pop singer Lisa Stansfield. It all concluded with “Adagio for Strings” – a version of the famous piece written by Samuel Barber conducted by André Previn, and taken from the soundtrack of David Lynch’s The Elephant Man. Someone wrote a book about how this is “the saddest music ever written” – and you would have had to be made of pretty strong stuff not to have been moved as the song swelled and the models filed back out onto the runway for the finale. 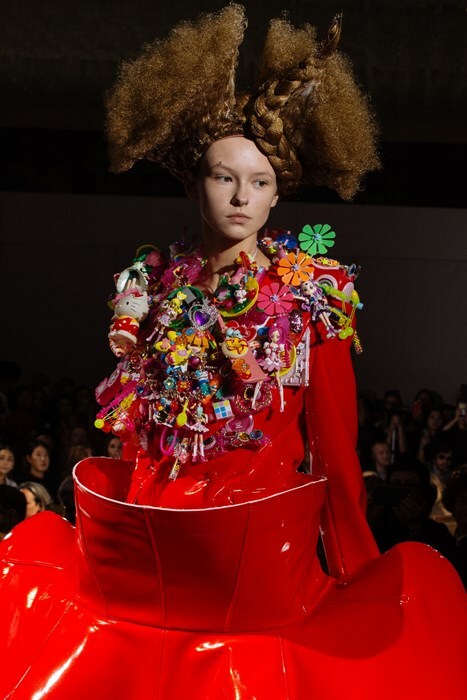 There was something about the combination of the childlike, girlish accessories with the heart-wrenching music that was extremely affecting – beyond the graffiti byline, it felt like Kawakubo was addressing very human ideas of childhood innocence, lost youth and the passage of time.